After Hurricane Irma’s destruction that left 12 senior care residents dead1, nursing homes in Florida are now required by state law to have permanent backup generators to power A/C during power outages. Being prepared for the worst keeps people safe. A nursing home has a responsibility to their residents to properly care for their wellbeing, but it is tough to do without electricity in unpredictable emergencies and power outages. It's easy to forget our reliance on electrical power until it's out. Not only is it the law in some states already, but investing in a permanent backup generator for senior care facilities is a valuable way to protect residents—while also ensuring the integrity of stakeholders and property risk managers in the face of preventable disasters. Hefty fines for not complying with city/state laws. Halted operations like food service, air conditioning, and other potentially life-threatening risks caused by extended blackouts. The need to move patients, which may not be possible in dangerous storms. Mold and building damage caused by loss of A/C and dehumidifiers in warm climates. Ultimately, emergency generators can help prevent unnecessary loss of life caused by extreme, unregulated temperatures during power outages. With safe and reliable backup power, you'll have no issue promoting your facility as one that cares about the safety of your residents. There are many factors to consider before buying a backup generator to power senior living centers. As a general rule of thumb, your commercial backup generator needs to have the capacity to power lighting, refrigeration, and HVAC systems in the building. In Florida, for example, backup generators need to be able to maintain an air temperature of less than 81 degrees for no less than 96 hours. Every city and state has different regulations and laws when it comes to implementing backup power in assisted living facilities. Checking with local and state codes should be the first step in the buying process. The Department of Energy website is a good place to start researching. Undersizing a generator will put a strain on the equipment, your facility, and your residents too. Remember that HVAC equipment will have higher starting power requirements that its running wattage. 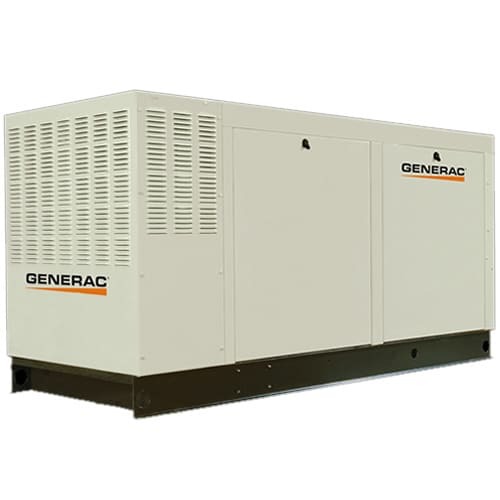 A commercial generator will also need to have the fuel capacity to continue running for the required amount of time, and larger generators have minimum tank sizes for this reason. LP/diesel generators also take up more space and require larger holding tanks for fuel, which will also determine where it can be installed at your location. 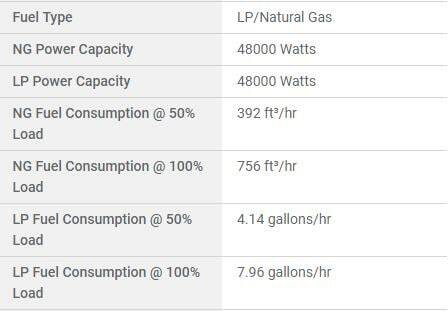 Different types of fuel are available on commercial backup generators, including natural gas, liquid propane (LP), diesel, and dual-fuel options as well. Sometimes the power capacity needed will determine the type of fuel required. The most stable fuel is natural gas, although a new natural gas line may need to be installed if a suitable line is not already available for hookup. In most areas, natural gas will be the most abundant fuel source during extended periods as it is most readily available. Your commercial generator must be installed on a concrete slab—local codes will dictate the location, orientation, and thickness. The install manual will have the pertinent information on other installation requirements for your generator. While also allowing for proper ventilation, they are generally installed in a place with plenty of clearance from any building opening (according to local codes) and in places that are protected from the elements that could affect the generator's performance. Single-phase power is found in most residential areas, and 3-phase power is used in commercial buildings and industrial parks. Although 3-phase power has many advantages and is available for some commercial buildings, many businesses do not have access or a need for it. Additionally, you cannot convert a 3-phase generator to power buildings that are wired for single-phase electricity. Your backup generator needs to be able to power every everything your primary electrical service does on a day-to-day basis—while also matching the electrical phase your building is wired for. A transfer switch is an important component of any generator, and selecting the right one is critical to ensure an easy transition from mainline to backup power. While choosing an automatic transfer switch is an easy task, speaking to a professional about commercial standby options will ensure a proper match. The backup generators you'll need for senior care facilities are built for intense use at heavy loads, and in extreme weather over extended periods of time. Liquid-cooled commercial standbys even have automotive-type engines that are built to last and stay reliable for years to come. Once one is installed, all that's needed is to make final preparations. Before an emergency, make a checklist to ensure that you can keep your backup generator running for at least 96 hours. During catastrophic events like a hurricane, having fuel delivered is an unnecessary risk and sometimes impossible. There are many maintenance and weather kits that help ensure the generator is ready to perform and can be checked and maintained on a regular basis. Additionally, ensure your facility has a comprehensive list of emergency supplies on hand, and the staff knows where to locate them. 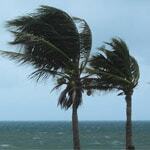 Check out our Hurricane Survival Kit guide for a list of ideas to get started. Backup generators in the commercial world require experienced professionals and contractors for proper installation. This is to ensure that they will be fully operational during an emergency and that legal regulations are upheld. Electric Generators Direct offers customers referred installation services from a network of licensed contractors who will install your backup system using the local and state codes for your building. Additionally, EGD works directly with manufacturers to ensure that our customers find the proper power solution they need, and not pay for the one they don't. You can rest assured that regulations and guidelines are followed and that an accredited professional will complete your installation services. Important Note: We cannot recommend backup power solutions for life-support devices or other critical medical equipment. These types of generators need to meet specific NFPA 110 requirements, which can be found here. Contact us if you have more questions. 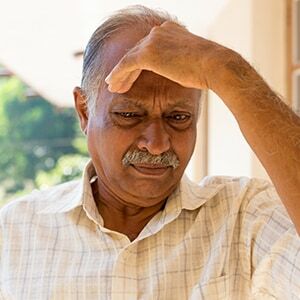 NURSING HOME EMERGENCY BACKUP GENERATORS: ELECTRIC GENERATORS DIRECT explains how property managers of senior care centers can pick the perfect backup standby generator for the building, and use our guided installation services to ensure the generator is installed correctly while following local and state codes.